Over Easter weekend, my step mother-in-law and I baked this cake as an experiment. 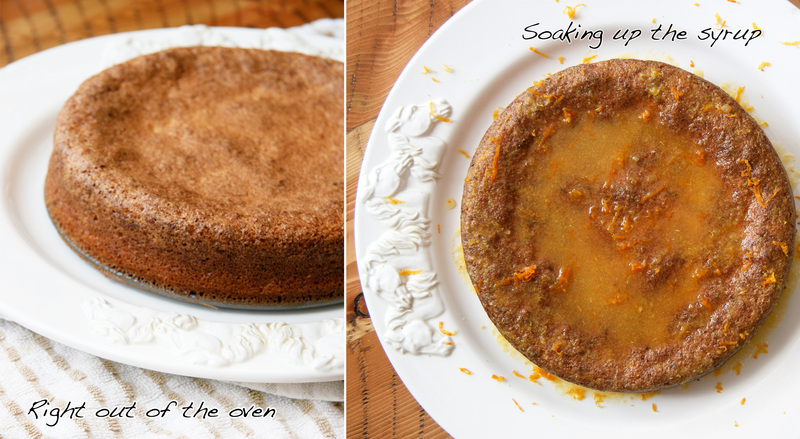 We were aiming for a flourless dessert, free of leavening and sugar and wound up tweaking a recipe for Flourless Orange Almond Cake she encountered while watching Laura Calder on the Cooking Channel. This is not a traditional fluffy cake. I repeat, this cake does not have resemble a traditional cake with a tender crumb and texture but it’s delicious in it’s own right. 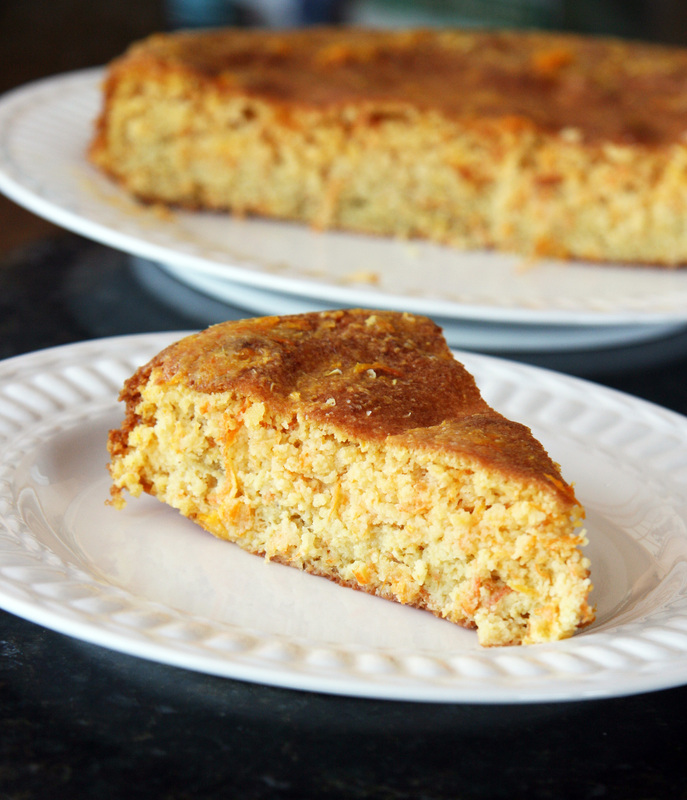 The rest of the family dubbed this recipe “The Fruit Loop Cake” as it sort of tasted like the cereal in dessert form! We made a few changes to the recipe but basically stood by the original this time around. On my own, I can go overboard tweaking recipes but I didn’t have full reins on this one (thanks B for keeping me under control!). Instead of the usual white sugar, we substituted erythritol* (see recipes notes for details). In place of regular oranges, we used tangelo’s (citrus fruit hybrid of tangerine and pomelo or grapefruit) which gave the cake a lovely distinctive flavor. The soaking syrup is simple; it includes Grand Marnier, a bit of delicious local honey, erythritol and juice from the fruit. It was delicious the first night we made it, but I thought it may have needed some added texture in the form of chopped nuts or something. Turns out, refridgerating the leftover cake made the erythritol slightly granular again (I assume it was the sweetener in the soaking syrup since it didn’t cook long) and that’s what added a slight crunch. We thought it was YUM! Optional: Whipped cream (we didn’t have this, would have loved to have served it with this!). Toasted chopped almonds for serving would add a lovely texture too. 1. Preheat the oven to 350 degrees F/180 degrees C. Grease (with coconut oil, butter or ghee) and line a 9-to-10-inch springform cake pan (or tube pan) with parchment paper and set aside. 2. To prepare the cake batter, separate the eggs into two bowls. Beat the yolks with the sugar and zest until ribbony, then stir in the almond flour and salt. Beat the whites to peaks. Stir a spoonful of whites into the yolk mixture, then fold in the rest, gently (do this carefully since no leavening is used and the egg whites help create height). Pour the batter into the prepared pan and bake until set, about 45 minutes. Let cool slightly, then unmold onto a serving platter. 3. For the syrup: Heat the orange juice, erythritol and honey together in a saucepan and boil for 5 minutes. Remove from heat and stir in the liqueur if using. Spoon the syrup evenly over the warm cake, letting the syrup soak in as you go (it will absorb most of it). 4. Slice and serve with whipped cream and/or toasted almonds (or refrigerate overnight if you want a slight crunch if using erythritol). Erythritol is a naturally-occuring sugar alcohol (polyol) found in fruits and fermented foods. It can be manufactured by fermenting glucose and is considered to be 60-70% as sweet as sugar. It is absorbed into the bloodstream from the small intestine and then excreted almost unchanged in the urine, so it does not affect blood sugar the way regular sugar and some other sugar alcohols do. Since it is absorbed before it enters the large intestine, it also does not cause as much of the gastric distress considered to be a side effect of most sugar alcohols such as xylitol and maltitol. Erythritol can have a mouth-cooling feel when eaten in concentrated forms, but in many baked goods, it is diluted enough for this effect to be unnoticeable. Erythritol is sold under the brand names such as ZSweet and Wholesome Sweeteners Organic Zero as well as several others. It can be found at some grocery stores and health food stores (such as Natural Grocers and Whole Foods) but is more affordable when purchased online. 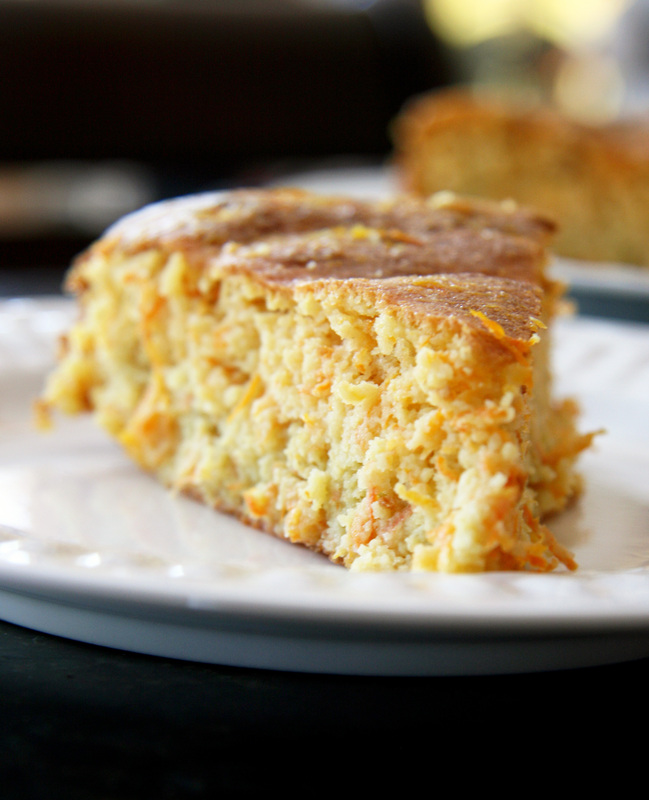 First of all, thank you for a new orange almond cake! 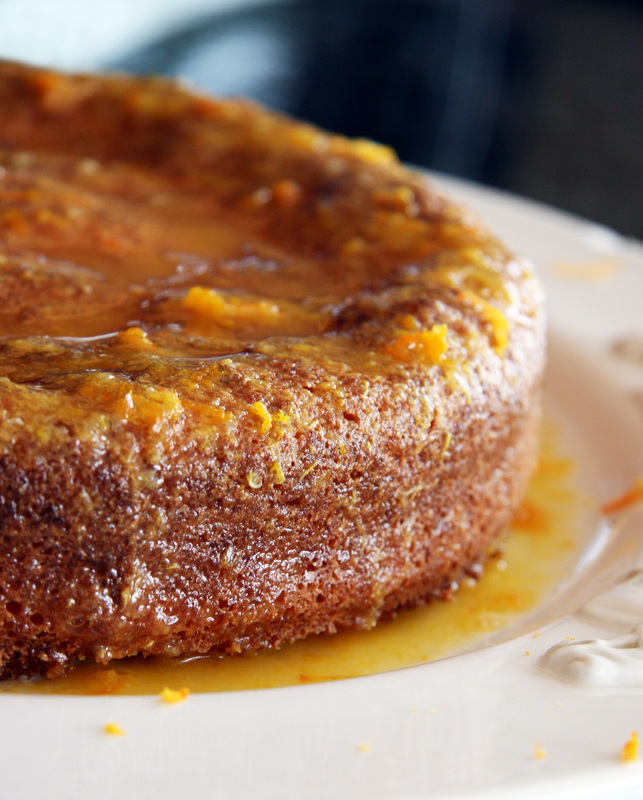 I fully intend to try this, since the traditional orange-almond flour cake recipe floating about out there never seems to set-up in the center and can be bitter with the wrong oranges. Second, if you truly want this to taste more like Froot Loops, I suggest finding a way to infuse some Earl Gray tea into it. The main flavoring, bergamont, is in Fruit Loops, or so my nose tells me (I have a very heightened sense of smell, and if I walk by a cup of earl gray, I smell fruit loops). I’ve had earl grey-infused milk chocolate cake, so this might be even more awesome! The Fruit Loop Cake what a fun name! I love Tangelos, they are so yum and I bet perfect in this cake. Looks like a succesful experiment. I love that you included the note about erythriol. I can’t spell it, oh well. I was thinking “i need to find out what that is, exactly” and then BAM, you read my mind. Also, erythritol has no calories…so it’s great for dieters! Great post! How delicious looking! I’d love to try it. I don’t know how I feel about erythriol. It just seems too good to be true. I worry about what they may discover 20 years down the line. Or maybe I’m just being paranoid. I don’t really know much about it. I love how you included a disclaimer at the beginning. I started doing that with my pancake recipe and will continue to do so with all future grain-free recipes. I don’t want to hear (or find on a forum that my bread didn’t taste like normal bread, although I pointed that out clearly in my post! Hmp.) that something didn’t taste like a normal whatever. So far I’ve been lucky but I know what’s coming because I see it all the time on other recipes. I love how juicy the cake looks! I’d definitely use coconut sugar as it’s so natural I buy mine from http://www.evolutionorganics.co.uk/the-raw-chocolate-co-organic-coconut-sugar-250gr/product. I’ve made a similar cake but without the syrup so I shall try this one next time.. thanks! OMG, this looks AH-MA-ZING! Gorgeous pics, too! I have to try it with almond pulp and date paste. Looooooove the idea of using soaking syrup. Reminds me of Babas au Rhum.